If you are building a silent PC with low noise components then a quiet CPU cooler should be on your top priority list, along with silent PC case fans. Almost all of the CPU Air Coolers come with a 4-pin PWM fan to cool down the heatsink. On idle or during low loads they are pretty quiet in operation, but when the load increases, the fan speed and thus its RPM increases and it can get pretty loud and audible, but a quiet CPU cooler has got the right combination between heatsink cooling capacity and fan RPM. It comes with a relatively bigger heatsink (with copper heatpipes) that has good heat dissipation design or thermal performance, and a silent fan with lower RPM and Fluid Dynamic Bearing (FDB) or proprietary low noise bearing. The fan also has anti-vibration rubber paddings on the corners to prevent vibrations / shocks and noise that can generate due to it. This makes the CPU cooler pretty silent, even at full load and they also do a great job in keeping the CPU cool without compromising any performance. Yes, there are some fanless CPU coolers available too that work passively with zero noise generation (0 dBA), but you cannot use fast mid to high-end processors with them, and also overclocking is completely out of the question with these passive CPU coolers with heatsink only. A silent CPU cooler is great to have for someone who are into sound recording, video recording or video editing, because it will not cause any undue interference with your work. Also, most of the gamers also prefer silent CPU coolers as they can’t tolerate too much noise. 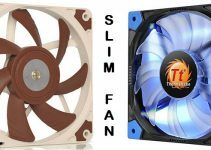 These silent CPU coolers are available in both 120mm and 140mm fan sizes, and here I am going to list down the best quiet CPU coolers that you can get for building a relatively silent PC for work, HTPC, Multimedia or for Gaming. Here are the best silent CPU Coolers that come with quiet 120mm fan. 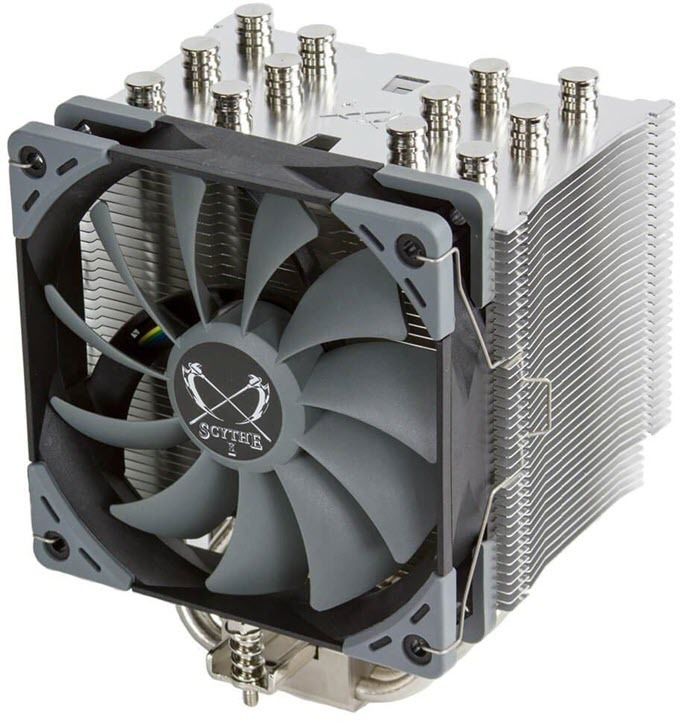 Scythe Ninja 5 CPU Cooler has to be the quietest CPU cooler in the market right now, that is great on performance, but low on price. It comes with a big heatsink with six copper heat pipes, and two Kaze Flex 120 PWM fans having Fluid Dynamic Bearing (FDB). These are very quiet fans, having speed of 800 RPM only, and maximum noise level rating of 14.5dBA only, which is quite low. Also, the fans have got rubber shock absorbers or padding at all four corners that eliminates the vibrations and the noise due to it. The fans are arranged in push/pull configuration and they do their job very well in cooling down the heatsink. The performance of this CPU Cooler is nothing short of amazing, and you can run your high-end processor on full load without any issues, and can even perform medium to decent amount of overclocking too, depending on the processor. It supports wide range of Intel and AMD CPU Sockets, including AM4 socket. The installation is on the easier side, which is done through its H.P.M.S. III (Hyper Precision mounting system III). The RAM clearance on this CPU cooler stands at 55mm, and you will not face any issues at all when using low profile RAM. The CPU is not very tall at 155m, but it is quite wider in depth (185mm with dual fans), so you have to make sure in advance that it fits in your case. However, most of the mid-tower and all of the full-tower cases will have no trouble fitting it. You can also remove one fan from it, if you are facing a bit of clearance issue with your case, and even with one fan, it is quite capable of delivering good enough cooling performance. This is a great CPU cooler for gaming and for enthusiasts who are looking for a good budget silent CPU Air cooler, but do not want to go for an AIO liquid cooler. The model number for this CPU Cooler is SCNJ-5000. Highly Recommended by me. 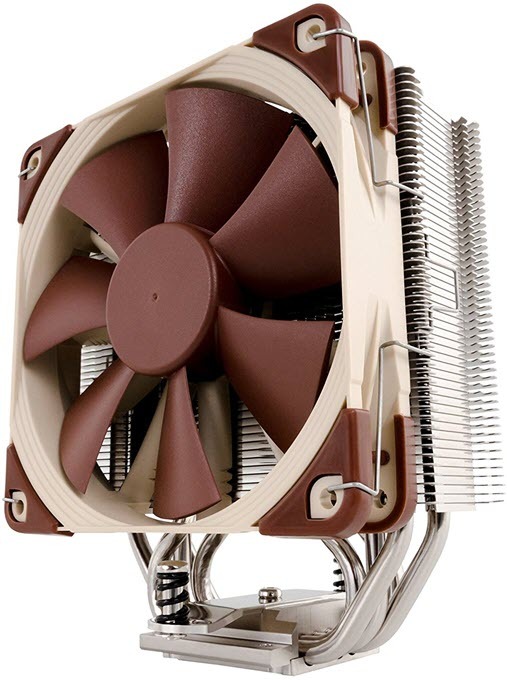 Noctua NH-U12S is a slim CPU Cooler that is also very quiet operation. It comes with a slim heatsink with five copper heat pipes and a Noctua NF-F12 PWM fan. This is a quiet fan with SSO2 Bearing and runs at speed of 300 – 1500 RPM, and generates maximum noise of 22.4 dBA. It also comes with a Low Noise Adapter (L.N.A. ), and using it you can reduce the maximum fan speed to 1200 RPM and noise to 18.6 dBA for more silent operation. 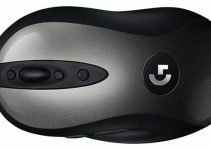 It also has got anti-vibration pads on the corners for reducing vibrational noise. The cooler is dual fan ready, and if you want more cooling performance, then you can also add another Noctua NF-F12 PWM fan too. Due to its slimmer design, it offers 100% RAM compatibility or clearance on almost all the motherboards, and it does not obstruct RAM with tall heatspreaders or heatsinks either. This cooler is compatible with most of the Intel and AMD Sockets including the AM4 Socket. It uses Noctua’s SecuFirm2 mounting mechanism that is very easy to use and install. The performance of this CPU cooler is good and it has no problems in running a high-end Intel Core i7 or AMD Ryzen 7 processor at full load. However, it has limited overclocking potential for higher end processors, but you can easily overclock mid-range processors like Core i5 or Ryzen 5 to some level. So, if you are in search for an all-round CPU Cooler that runs quiet, requires less space, offers good RAM clearance and is way better than stock CPU Cooler, then you have to get this one. Note: Since 2019, this CPU Cooler comes with AM4 brackets, but if you want a CPU Cooler specifically for AM4 Socket CPUs only, then you can get NH-U12S SE-AM4, which is a special edition of Noctua NH-U12S that comes with AM4 mounting hardware only, while other specifications remain the same. 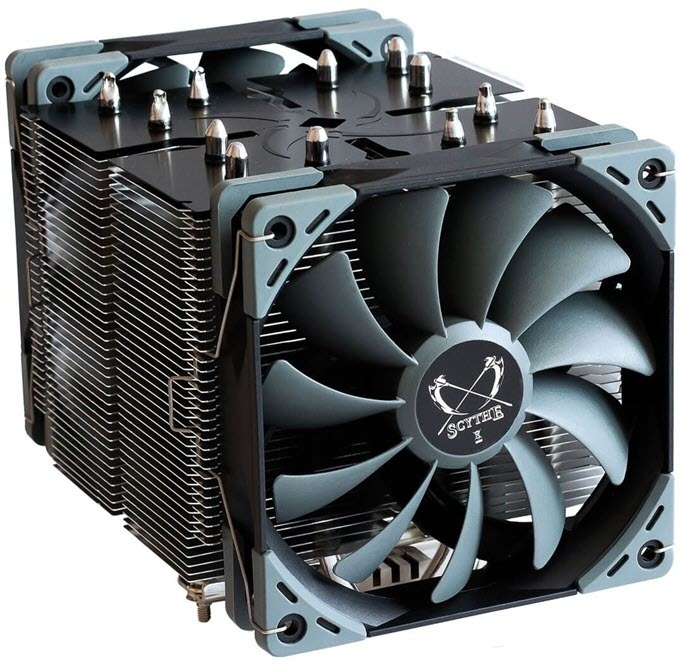 If Scythe Ninja 5 is looking too big for your preference, then you can opt for another very good quiet CPU Cooler from Scythe, which is Scythe Mugen 5 Rev.B CPU Cooler. Just like its bigger brother, it also supports almost all of the popular Intel and AMD sockets, including AM4 one. It comes with a decently sized heatsink with six copper heatpipes, and a Kaze Flex 120 PWM fan. The fan comes with Fluid Dynamic Bearing and spins at 300 – 1200 RPM, with maximum noise of 24.9 dBA. The noise level rating may be a little higher on paper, but in reality, the fan is much quieter and you will barely able to hear at full speed or load. The rubber pads on all the four corners of the fan helps to prevent vibrations and noise due to it. Optionally, you may also install another fan too, if you desire more cooling performance. The CPU Cooler performs good and it can easily keep your Core i5 and Ryzen 7 processors cool, even at full load at full precision boost or turbo boost. You can also perform some decent amount of overclocking on it, but not too extreme with top of the line CPUs. The cooling performance of this CPU Cooler is much better than Cooler Master Hyper 212 Evo, which is a very popular budget CPU cooler. The heatsink has asymmetrical and offset design that allows good amount of RAM clearance and their access. Is uses H.P.M.S. II (Hyper Precision Mounting System II) that allows for pretty easy and hassle-free installation. The cooler falls in budget price category, but offers performance of a much more expensive premium quality cooler. Noctua NH-U12A is a new CPU Cooler from Noctua that is designed for ultimate performance without generating much noise. This is one of those high performance 120mm CPU Coolers that can perform equal or even better than most of the 140mm CPU Coolers in the market right now. It comes with completely redesigned heatsink (compared to the NH-U12S), with whopping seven heatpipes that are soldered to the heatsink fins for better thermal performance. It has got dual Noctua NF-A12x25 PWM 120mm fans that are arranged in push-pull setup, and comes with Noctua’s proprietary SSO2 bearing that is known for high reliability and low noise generation. These fans spin at speed in range of 450 – 2000 RPM, which may be slightly on the higher side, but generates very less noise (22.6 dBA) because of their optimized fin and body design. Moreover, with the bundled low noise adapter, you can further reduce the noise level to 18.8 dBA only without compromising any significant cooling performance. Also, the fan has got anti-vibration pads on all four corners to reduce vibrations and noise to further extent. The heatsink is asymmetrical in design that allows for 100% RAM compatibility on LGA115x and AM4 motherboards, and you will have no problem in fitting RAM with tall heatspreaders on most of the motherboards. However, on LGA2066 motherboard, the rear fan will overhang the RAM slots on the left-hand side of the socket, so RAM modules should not exceed 42mm in height in this case. Also, the CPU Cooler does not block the PCIe slot either. This CPU Cooler is very well suited for high-end CPUs and can even support moderate overclocking too. The installation process is easy as it uses the Noctua’s SecuFirm2 multi-socket mounting system, which is a breeze to use. So, if you are looking for a high-quality and modern 120mm quiet CPU Cooler with class leading performance, then don’t think twice and just get this one. Here are the best silent CPU Coolers that come with 140mm fan. Generally, 140mm CPU Coolers perform better than 120mm CPU Coolers, because of their bigger heatsink and bigger fan. Also, these CPU Coolers are best suited for high-end CPUs and overclocking. 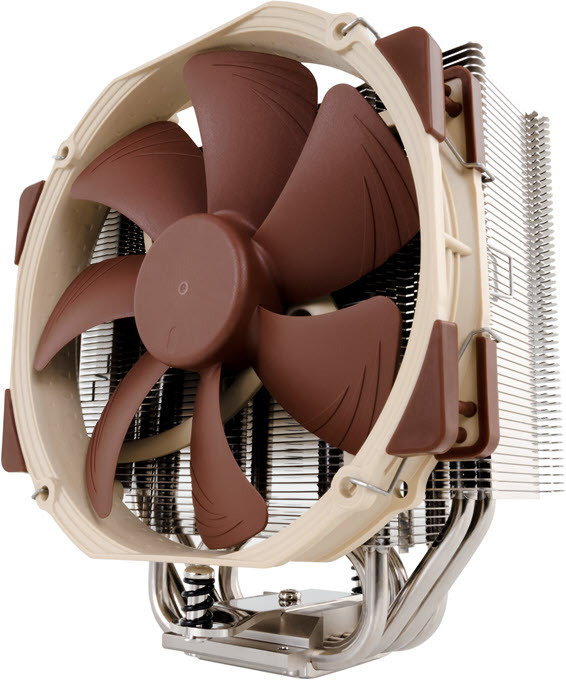 Noctua NH-U14S is a slim 140mm CPU Cooler that works quietly and is also big on performance. It is single tower CPU Cooler that comes with a slimmer heatsink with six copper heatpipes, and 140mm Noctua NF-A15 PWM fan that operates silently. The fan comes with SSO2 bearing, spins at speed of 300 – 1500 RPM, and generates maximum noise of 24.6 dBA. However, in reality, the fan is much quieter and you can barely hear it even at full speed during high loads. It also has anti-vibration rubber paddings on all of its four corners to reduce vibration by keeping noise level to minimum levels. With L.N.A., the maximum noise level can be further reduced to 19.2 dBA only. It is a dual fan ready CPU cooler, which means you can optionally mount another fan on it if you want to increase its cooling to higher level. The CPU Cooler is only 150mm in width and does not interference with your first PCIe slot. Also, because of its slim design, it offers full RAM compatibility on most of the LGA20xx and AMD motherboards. However, the CPU Cooler is a bit taller at 165mm, and may not be able to fit in some mid-tower cases that support CPU Coolers to up to 160mm in height. The performance is as usual remarkable and you can easily run your high-end processors on it at full speeds & load with some amount of overclocking. The installation is easy, which is done through Noctua’s SecuFirm2 mounting system. It supports wide range of Intel and AMD CPU sockets ranging from LGA 1151, 2066 to AMD AM4. 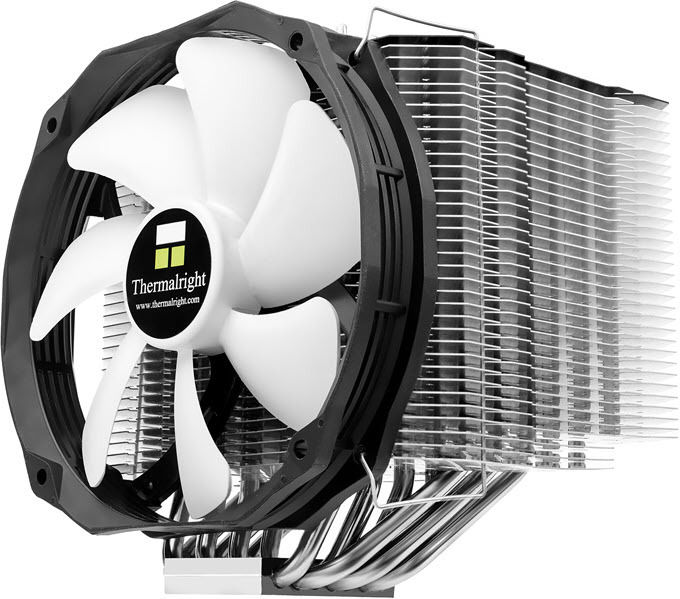 Thermalright is a Taiwanese company that makes high quality PC cooling products that include CPU Coolers, Case Fans, Thermal Paste and Accessories. Here we have from it a high performance and one of the quietest 140mm CPU coolers, which is Thermalright Le Grand Macho RT. 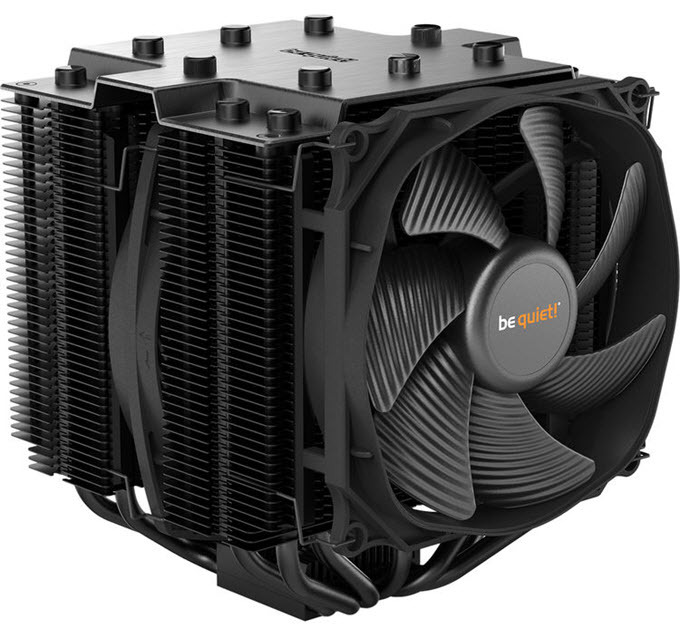 This CPU Cooler is bigger on size and comes with a bulky heatsink with seven copper heatpipes, and a dead silent 140mm fan with Fluid Dynamic Bearing (FDB). The fan spins at relatively lower speed of 300 – 1300 RPM and generates maximum noise of 20 dBA only. Also, the anti-vibration pads on its corners prevent noise that can occur due to vibrations. The CPU Cooler supports all the popular Intel and AMD CPU Sockets, including the AM4 one. The installation might be a little trickier for some users, but for regular PC builders, it is not much of a task. Because of its asymmetric and offset heatsink design, RAM clearance is not an issue with this CPU Cooler on most of the motherboards. Also, it does not block your first PCIe slot either, which is great for a cooler of this size. It stands at 159mm tall and can fit almost all of the mid-tower cases perfectly. The CPU Cooler is rated at maximum TDP of 300W, and can easily cool down your modern-day high-end CPUs, even with good amount of overclock, and running at full turbo boost speeds. This CPU Cooler can beat some of the best dual tower CPU Coolers in the market that include Noctua NH-D15, Noctua NH-D15S, be quiet! Dark Rock Pro 4 and even AIO Liquid CPU coolers, which is just remarkable. Highly Recommended by me. Here are the best twin-tower CPU coolers that operate silently and delivers great cooling performance. These are one of the biggest CPU Air coolers around, and are best suited for high-end processors and overclocking. They do require a bigger PC case and motherboard to fit properly, because of their huge size. These dual tower CPU coolers can even match the performance of top AIO Liquid CPU Coolers, and in some cases, they can even outperform them. be quiet! Dark Rock Pro 4 is a nice-looking CPU Cooler that has great build quality, and delivers quiet cooling performance. This is one of the quietest dual tower CPU Coolers around, and is even quieter than the Noctua NH-D15, which is also a silent dual tower CPU cooler. It comes with two heatsinks with seven copper heatpipes, and brushed aluminum top cover. It comes with two fans, one is 120mm fan that is mounted on the side, and other one is a 135mm fan that sits in the middle of two heatsinks. These are Silent Wings PWM fans that are very quiet in operation, even at full speed. The maximum noise level rating for this CPU cooler is 24.3 dBA and it operates very quietly even at full load. The whole CPU Cooler is black in color and looks very stylish and modern. It supports most of the Intel and AMD sockets and the installation of the cooler is on the medium, which means it is not that hard but not very simple either. 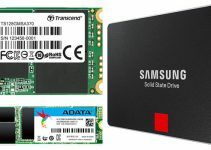 Because of its huge form factor, RAM clearance and case clearance can be an issue for some smaller motherboards and computer cases. The height of the CPU cooler is 162.8mm, which is on the taller side, and you must be pretty sure about your case specs for its CPU Cooler support. This CPU Cooler is rated at 250W TDP, and can easily support high-end processors easily. However, for high-end CPUs, it does not offer much of an overclocking headroom, so it is best to be avoided. So, if you are looking for a beautiful and well-designed quiet CPU Cooler, then it will not disappoint you. 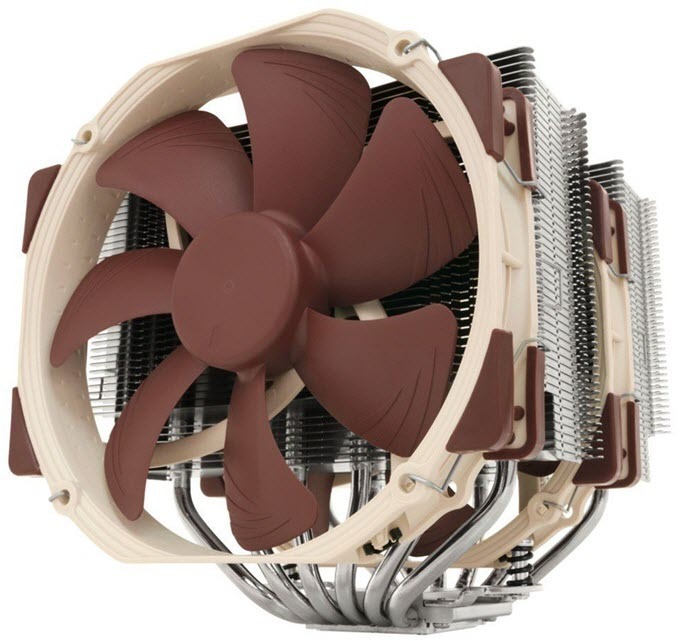 Here we have a very popular dual tower CPU Cooler, which is Noctua NH-D15. 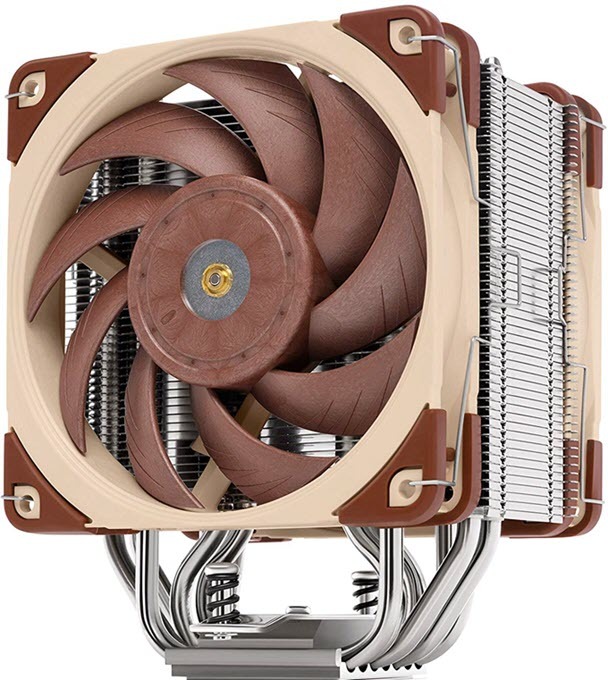 It is an upgrade over the older Noctua NH-D14, which was also a great CPU Air cooler. Noctua NH-D15 comes with dual tower heatsinks with six copper heatpipes, and dual 140mm Noctua NF-A15 PWM fans arrange in push/pull setup, where one fan is installed in the space between the two heatsinks, and one is at the side. The fans come with SSO2 bearing with rotation speed of 300 – 1500 RPM, and have maximum noise level rating of 24.6 dBA. They also have anti-vibration rubber pads on the corners to absorb shocks and thus eliminates vibrational noise. The CPU Cooler is compatible with almost all Intel and AMD Sockets, including the AM4. It is quite wide (161mm) and tall (165mm), so clearance can be an issue for smaller cases and motherboards. It provides 64mm clearance for tall memory heatsinks in single fan mode, but in dual fan mode, you should use a standard height RAM (up to 32mm) with it. Noctua’s SecuFirm2 mounting system makes the installation pretty easy, which is always a good thing. This may not be a pretty looking dual tower cooler like the above mentioned be quiet! Dark Rock Pro 4, but it performs a little better than it. It can handle high-end CPUs like a champion, and you can also do moderate amount of overclocking too, depending on the processor TDP. Note: A dedicated AMD AM4 Socket variant of this CPU Cooler is also available, which is Noctua NH-D15 SE-AM4. You can also reduce the fan speed and noise of your existing CPU Cooler Fan by using a good quality low noise adapter. Here we have Noctua NA-SRC7 Low-Noise Adaptor (L.N.A.) that slows down the speed of a 3-pin or 4-pin PWM fan, and thus makes it quieter in operation. It is officially designed for Noctua 4-pin fans (except industrialPPC series), but it can work with most of the 4-pin PWM and 3-pin fans too. It works only with 12V fans that has maximum power draw under 2.5W. Basically, it contains a resistor that limits the voltage to the fan, and makes it spin slower than the normal. However, the PWM functionality of the fan still works with it. There is no denying fact that most of the PC users prefer to have a CPU Cooler that delivers good cooling performance along with quieter operation. A quiet CPU cooler can make a drastic reduction in the overall noise of your PC, and if you also have silent case fans installed, then your PC will be very silent, even at full load. These quiet CPU coolers have larger heatsinks, so as to compromise on fan speed, but without compromising on cooling performance. Above, I have carefully selected the best quiet CPU Coolers that you can get for your silent PC, and if you have doubts regarding them, then you can ask your queries in the comment section below.